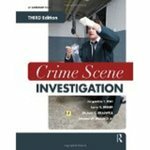 "Crime Scene Investigation" by Jacqueline T. Fish, Larry S. Miller et al. Crime Scene Investigation offers an innovative approach to learning about crime scene investigation, taking the reader from the first response on the crime scene to documenting crime scene evidence and preparing evidence for courtroom presentation. It includes topics not normally covered in other texts, such as forensic anthropology and pathology, arson and explosives, and the electronic crime scene. Numerous photographs and illustrations complement text material, and a chapter-by-chapter fictional narrative also provides the reader with a qualitative dimension of the crime scene experience.